Sisters Rush [left] & Young [right] with two patients from Lemnos, now in Egypt. February 1916. Anne Donnell, National Library of Australia MS 3962. Click on image to enlarge. Edith Rush was a nurse with connections to the Port Stephens area. She sailed with No 3 Australian General Hospital (AGH) in May 1915. Leaving Sydney, the Mooltan berthed in Melbourne, Adelaide and Perth to pick up additional passengers before heading across the Indian Ocean. Sister Anne Donnell joined the Mooltan in Adelaide and published an account of her wartime experiences in 1920 as Letters of an Australian Army Sister, Angus & Robertson, Sydney. In her published letters she mentions Edith Rush several times and helps us to build a picture of the kind of person she was. The photos of Edith in the Anne Donnell collection indicate a cheerful, outgoing personality. In early 1917 Edith and Anne were part of a group of nurses that visited Ireland and Scotland whilst on several weeks leave. In Ireland they marvelled at “the donkeys bringing in the low basket carts and the women wrapped in shawls” and laughed when they were jeered at by urchins who mistook them for suffragettes because of their uniforms. In Scotland they visited places made famous in literature and legend – Rob Roy’s cave, Loch Lomond and an “indescribably beautiful” drive to see Stirling Castle. Anne Donnell bemoaned the fact that “on the 23rd [of March] Sister Rush and I have to leave this restful spot.”[iv] The beauty and tranquility of the surroundings would have been the more keenly felt in contrast to the life to which they would soon return. 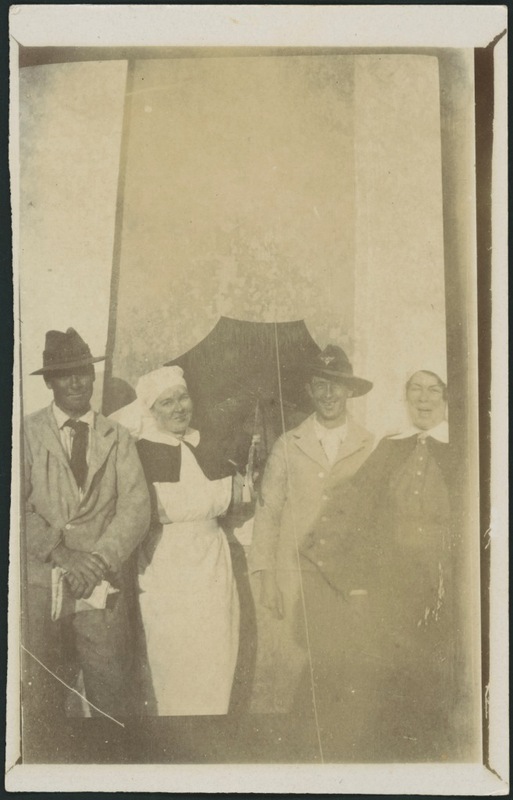 Edith, now promoted to Sister and an Associate of the Royal Red Cross, the nurse who had managed somehow to find a birthday cake for her friend Anne Donnell during the privations on Lemnos and who was now with No 2 AGH had remained a good team member throughout. As the last of the nurses prepared to leave the unit they held a meeting to decide how to dispose of the little extras that had been accumulated to make the Sisters’ Mess more comfortable. At the meeting a vote of thanks was given to five nurses including Edith for “their admirable help in conducting special work in the Sisters’ Home and Mess.”[vi] How many other birthday cakes had she provided for her colleagues in her four years of service?